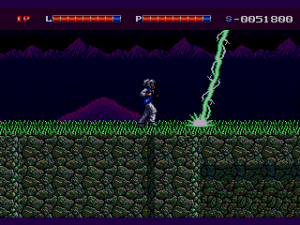 Released in the early days of the Genesis, Shadow Blasters is an obscure side-scroller with a few bright ideas. 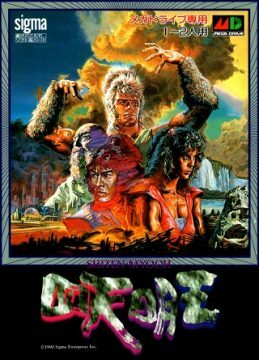 In North America, it also had a terrible cover, and a title easily confused with Sega’s Shadow Dancer. 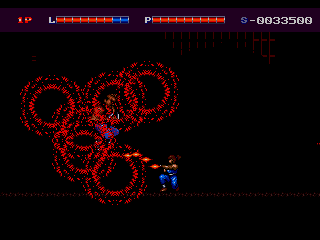 Fighting is done through projectile attacks. By holding the attack button, you can charge up a more powerful blast; there are four attack levels, depending on how full your gauge is when you release the button. What separates it from similar mechanics in other action games is that enemies drop items which gradually pre-fill that gauge. As you pick them up, your basic attack becomes stronger and stronger, and it takes less and less time to charge up your strongest move, until eventually it becomes your basic attack. Similarly, the walking speed, which is initially sluggish, and jumping height, which starts off quite low, can both be improved on up to three times by gathering the corresponding items. All those upgrades remain until you die, so it is crucial to keep your character alive; this is where the game’s other big mechanic comes into play. 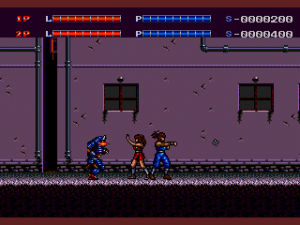 There are four playable characters, each with their own projectile type and bases stats, and you can switch between them at any time. One hit away from biting the dust? Just switch for a character who’s in better shape. Each level contains an item that fully restores your health, so that if you play skillfully and strategically, you can buff up your team as you advance through the game without ever letting any member die. Should one of them get killed, he or she can no longer be selected until all characters are dead and you have to start the level over. While you have infinite credits, a few of the harder stages are especially difficult to deal with if you don’t reach them with a powered-up team. A vital item in an out-of-the-way spot. At least, that’s how it was originally. While it wasn’t rare for Japanese games to be made more challenging when brought overseas, Shadow Blasters was among the rarer cases where the opposite was done. 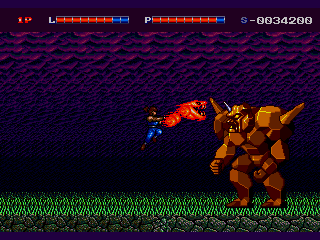 Bosses and enemies had their health cut down, while healing items and upgrades were made more plentiful, resulting in one of the easiest action titles on the Genesis. Even the American version’s Hard mode is easier than the Japanese’s Normal, which wasn’t exceptionally hard to begin with. While Shadow Blasters is still decent fun the first time around, Shiten Myooh is more involving and has more lasting value. 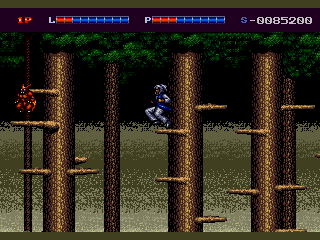 The archetypal forest level can get tough in the Japanese version. 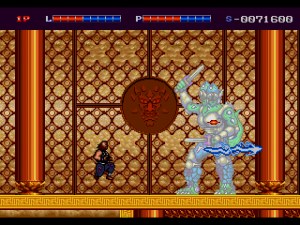 The first six levels can be played in any order. The Street and Mountain levels are purely linear, but the rest feature side-paths, dead ends, and several layers of vertical space. As enemy drops are pre-set rather than random, the main incentive to explore is to find and kill the enemies that hold the restorative items and upgrades, before making it to the end where a boss awaits. Once you’ve completed those six levels, you’re taken to the final two (three if you count the final battle), where opportunities to heal are more plentiful. 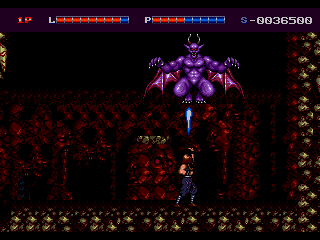 Most of the bosses can be disposed of quickly with the right characters, provided they’re powered up to their maximum. 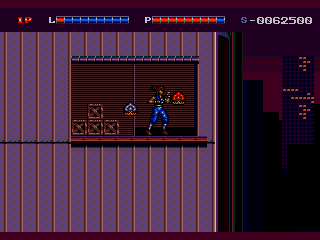 In general the game tends more towards fighting than platforming. 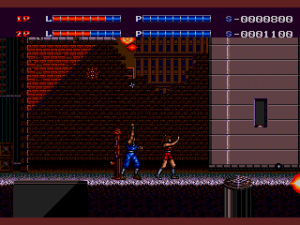 While the walking speed remains a little slow even when fully powered-up, attacks come out nice and fast, and part of the gameplay’s appeal is the way in which it stimulates your reflexes by throwing enemies at you from left, right, and above. 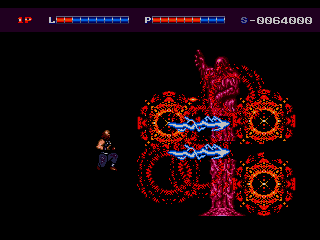 Beaten bosses explode with style. 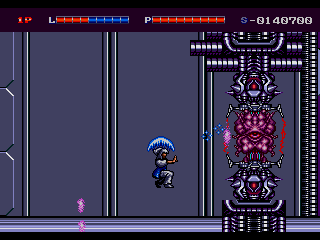 Shadow Blasters also offers two-player co-operative play, a rarity in the genre. 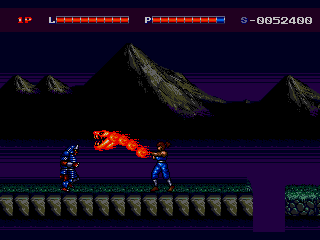 The added firepower makes it feasible for both players to stick with the same character throughout the entire game, while retaining the flexibility to change and exchange characters any time they like. The cast were given Western names for the American version, but ironically retained their very Japanese backgrounds. 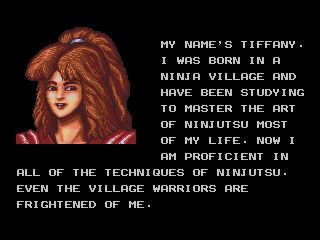 Kotarou and Ayame, or “Horatio” and “Tiffany”, are both ninjas, trained since childhood in the art of Ninjutsu. 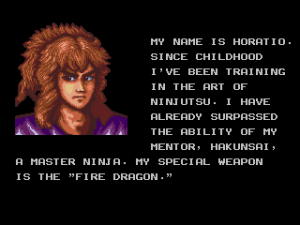 Kotarou’s Fire Dragon is the strongest attack in the game, but must be aimed carefully as only one can be on-screen at a time. Ayame uses wind magic, which tends to move in diagonals or curves. Her powered-up attack is a tornado that acts like a homing missile. Both characters have low defense. Kidenbou / Marco is a Buddhist monk who is, in his own words, “better at fighting evil than reciting sutras”. He’s slow and tough. 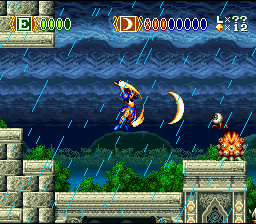 He shoots thunder, which, when fully powered-up, spreads out vertically into three bursts, making it easier to hit certain out-of-the-way targets. Finally, Senshirou / Leo is a Kendo master who has never lost a duel. His projectiles bounce around or act as boomerangs, which is a double-edged sword as, again, only so many can be on-screen at once. All four also have a one-time area attack to be used in desperate circumstances, activated by pressing C.
The story takes on mythical and mystical overtones. As the evil Asura threatens humanity with his armies, the good God Hyprion grants four chosen warriors the power to fight back. 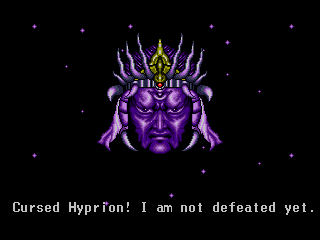 The name Hyprion likely refers to Hyperion, a Titan of Ancient Greek mythology who embodied heavenly light, while the Asura (or Ashura) are the flawed minor deities of Buddhism and Hinduism associated with anger and greed. The manual provides a more elaborate backstory, describing debates between caring Gods and others deeming humans unworthy of help, until finally Hyprion decides to intervene. 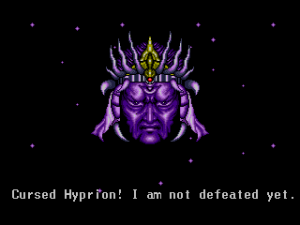 Without revealing too much, the game ends in an epic battle between Gods, followed by a curiously ambiguous ending. 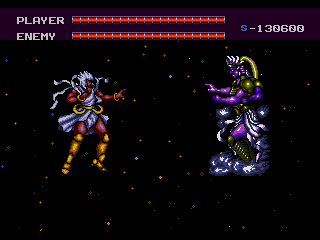 The final battle looks cool, but the controls take a moment to figure out. While neither the backgrounds nor sprites are impressive per se (aside from certain bosses), the game benefits from the sort of dark ambiance common among pre-Sonic Genesis titles, with plenty of night skies, lonely landscapes and dilapidated buildings. The actual level themes feel like a tour through ninja-game tropes at times – there’s the city level, the futuristic base and the forest where you get around by jumping from branch to branch – but the all-pervasive darkness maintains a different feel throughout the game. The final level, set in a Japanese temple surrounded by red skies and yellow clouds, is the best-looking of the bunch. This ambiance is supported by a surprisingly solid soundtrack, full of pounding basslines and memorable melodies. The credited composer, Kim Songdong, is virtually unknown; this and the Genesis port of Zoom! may be his only work in the field. 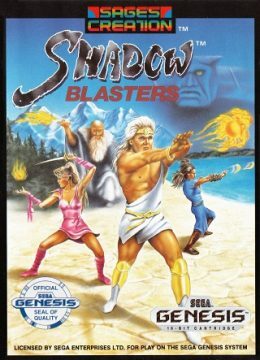 Though their name appears nowhere in-game or on the box, Shadow Blasters was developed by Cyclone System, a small outfit founded by former Aicom employees. At the time, it was common for minor video game companies to toil in the shadows until they’d acquired enough clout to claim their games; even Atlus and Arc System Works started out as anonymous subcontractors. Unfortunately, Cyclone System, like many other companies, never reached that point. Among their more notable titles are the NES cult-classic Wurm and a Taito-published Genesis side-scroller by the name of Saint Sword. 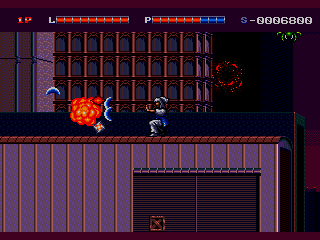 Though the company went bankrupt in the early ’90s, many of their games are worth a look, Shadow Blasters among them. 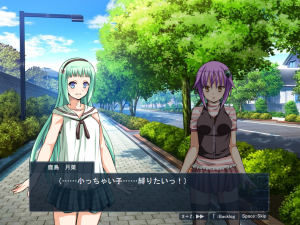 GDRI – An interview with former Cyclone System employee Shouichi Yoshikawa.